Patrick Kane #88 of the Chicago Blackhawks and Drew Doughty #8 of the Los Angeles Kings chase the puck next to goalie Jonathan Quick #32 in the second period of the NHL game at the United Center on November 2, 2015 in Chicago, Illinois. The Los Angeles Kings had a seven-game winning streak coming into Monday’s game against the Chicago Blackhawks, but behind a goal and an assist from Patrick Kane, the Hawks were able to secure a 4-2 victory. Corey Crawford made 34 saves, including 19 in the third period alone, to snap the Kings’ streak and to give them their first loss of the season when they led after two periods of play. Kane’s goal and assist extended his point streak to seven games. The Blackhawks knew they had to get out to a good start against a Kings team that had won seven straight games, and they did exactly that as they scored on an odd-man rush. Artemi Panarin pushed the puck up the ice on a nice defensive play, and when Ryan Garbutt found Jonathan Toews with a pass, the captain didn’t miss as he ripped home a shot to give the Hawks a 1-0 lead. The Kings struggled to get going offensively, but they finally were able to get on the board with about five minutes to go in the frame. Alec Martinez used Marko Dano as a screen as he pinched in from the blue line, and Corey Crawford was unable to catch the shot as it sailed past his blocker to knot things up at 1-1. With about a minute to go in the period, the Kings scored again. With Marcus Kruger and Andrew Shaw skating up-ice, Anze Kopitar was able to find an open seam and put home a rebound off of a Jake Muzzin shot to put the Kings ahead by a 2-1 score after 20 minutes of play. As the second period got underway, both teams generated some quality chances, but neither were able to sustain the pressure. Muzzin nearly scored a goal after a vicious slap shot beat Crawford, but it rang loudly off the post and was cleared away by Eric Gustafsson. Patrick Kane had several good chances as the period wore on, but Jonathan Quick was able to stop them and keep his team in front. Early in the third period, the Blackhawks knotted things up again. With the Kings’ defense giving him all sorts of space, Kane cooly skated into the zone, wound up at the top of the face-off dot, and ripped a wrist shot that bounced off of Alec Martinez’s legs and over Quick’s glove to tie the game at 2-2. 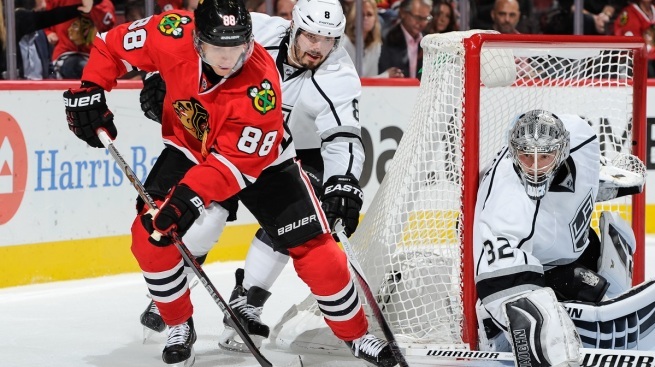 The Hawks’ offense continued to churn as the period wore on, and they racked up numerous scoring chances. Panarin got a pass as he came out of the penalty box and set himself up with a clean breakaway, but Quick stoned him to keep the game tied. Kane also had a good chance as he fired a puck from behind the net back into the crease, but the puck bounced off of Quick’s pad and skidded just wide of the post. Finally, the Blackhawks were able to capitalize and take the lead. Kane once again was the one getting things going as he skated behind the net, and he dished a quick backhanded pass toward the goal line. Teuvo Teravainen was there to accept the pass, and he quickly fired a one-timer past Quick to give the Blackhawks a 3-2 lead. The Kings got a late power play thanks to a Ryan Garbutt penalty, but the Blackhawks were still able to score an insurance goal to put it away. Toews made a great move to free up a seam for Artem Anisimov through the neutral zone, and he scored on the ensuing breakaway to give the Hawks a 4-2 advantage that they would never relinquish. The Blackhawks will next take the ice on Wednesday night when they welcome the St. Louis Blues to the United Center.